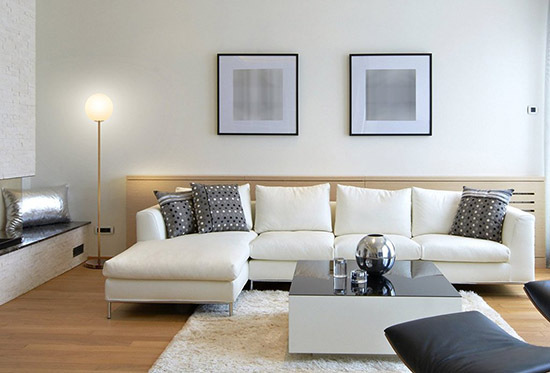 A beautifully designed minimalist floor lamp can improve the look of your minimalist space tremendously. I believe, lighting is one of the most important components of good interior design. 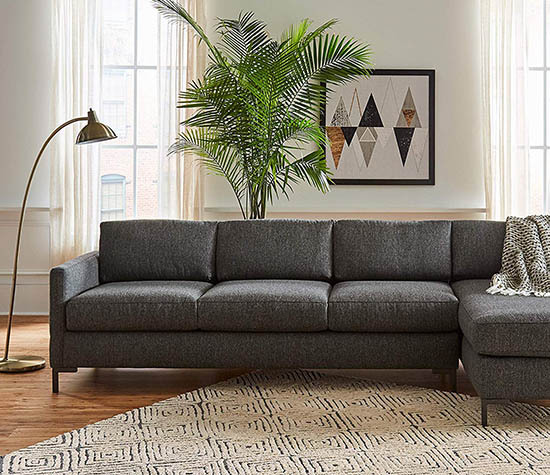 As such, I felt curious and went looking around for the 15 best looking modern minimalist floor lamps that can be perfect for minimalist homes or even offices. So without wasting much time, here is the list! 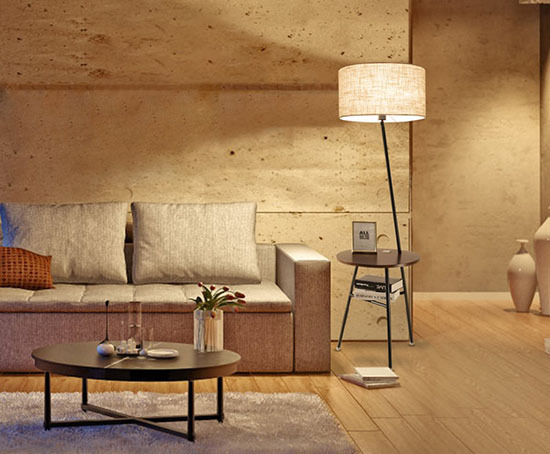 The Sky LED floor lamp by Brightech is a beautifully designed minimalist floor lamp. It has an elegant round top with a sleek, straight body, ending with a minimal round base. The slim design also helps it fit easily into small and narrow spaces. It comes in 7 different colors. The LED light is very bright and also dimmable. You can do adjustments using a built-in dimmer. Moreover, the floor lamp uses a touch switch to power on or off which is great. The base has a good weight which prevents wobble and adds a great amount of stability. In terms of built, the floor lamp is very well made using sturdy metal as the main material. You can set it up with a Smart Plug and connect it with Alexa or any smart home devices. 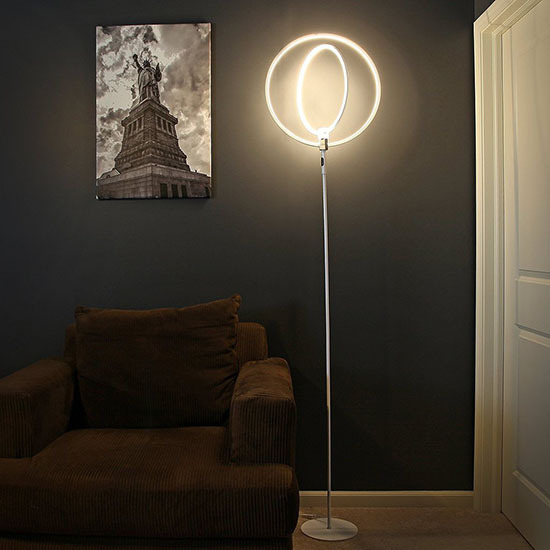 I love the design of this floor lamp by Globe Electric. It looks gorgeously minimalistic and industrial. It has an elegant design with the straight body turning into a semi rectangular frame at the top, followed by the exposed bulb facing downwards creating a beautiful downlight. I also love the matte black finish. The base has a minimal round design with a good weight which keeps the lamp standing upright and stable. I can imagine this lamp being in a modern bedroom or living space. Conveniently, the bulb has a 5-foot-cord which makes it easy to place in corners where the outlet may be far. It comes in 5 different colors, and has an adorable table lamp version. 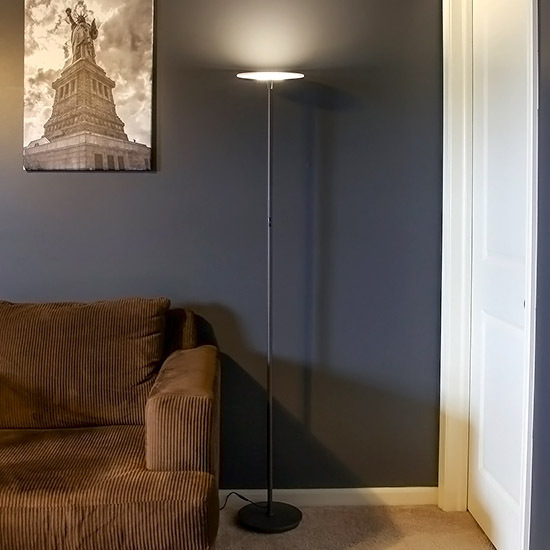 This is a very cozy minimalist floor lamp, great for bedrooms and living rooms. 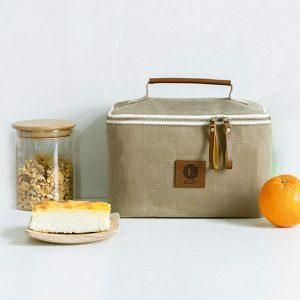 It comes with 3 shelves which you can put your favorite items on. I love the basic rectangular shape and the beautiful wooden frame. It adds a natural vibe while also looking modern and homey. 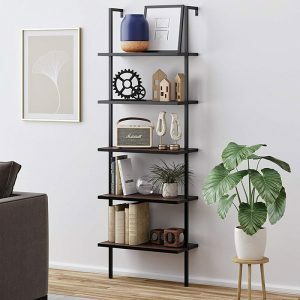 The design is inspired by Japanese-style shelves. The lamp gives a nice soft ambient glow, which gives a nice relaxing feel to the space. The light is LED, which saves a lot of power and lasts a very long time. The lamp comes in 4 different colors and is also Smart Plug compatible which can make it work with smart home devices. This floor lamp has a nice classic yet minimalist design. The top is a cylindrical lampshade, the body is a sophisticated looking wooden walnut finish stem, while the base is a nice weighted round metal. I love the simple design and the neutral tone of the natural linen lampshade. It gives a nice natural upscale look. According to users, this lamp is easy to put together. 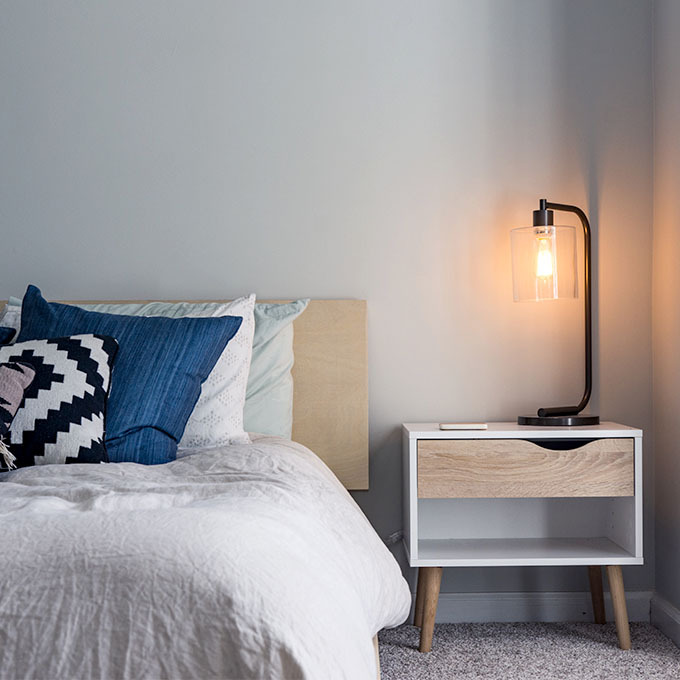 The lamp is also compatible with a Smart Plug for connection with smart home devices. It uses LED bulb which saves energy and can last a very long time. 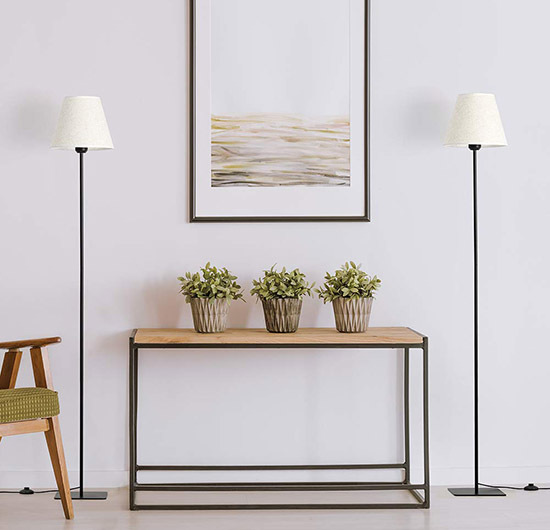 The lamp is perfect for homes or spaces with a slightly classic, mid-century minimalist theme. 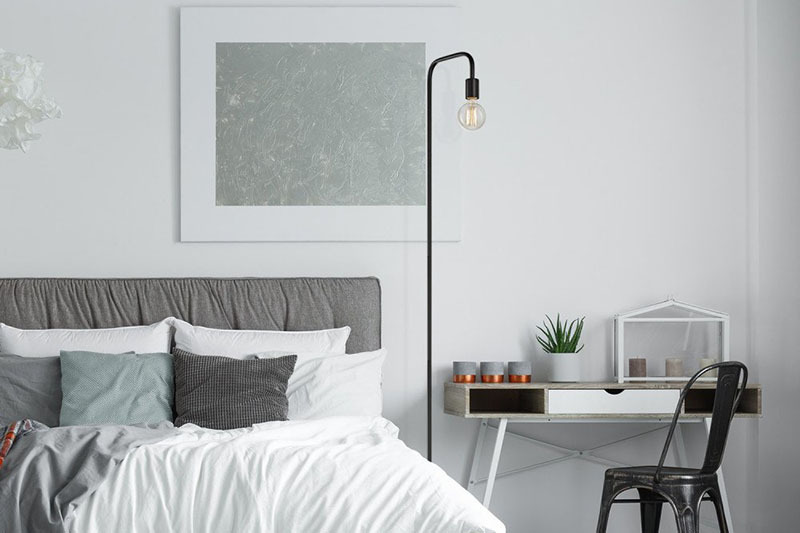 This minimalist metal floor lamp by LEPOWER is great for spaces like student rooms or dorm rooms. The nicely designed gooseneck is easily adjustable which is great if you want to light a table. It can also look great in living rooms and even offices. The lamp is made of high-quality metal lampshade and base. The base is weighted to ensure it is wobble free and stand sturdily in place. The lampshade has a heat dissipation base to keep the heat from accumulating. This floor lamp by Brightech has a gorgeous globe lamp design. It looks modern, minimalist and sophisticated. I can see this being great for a more upscale, luxury themed space. The globe gives off a soft diffused light which creates a cozy and relaxing vibe. 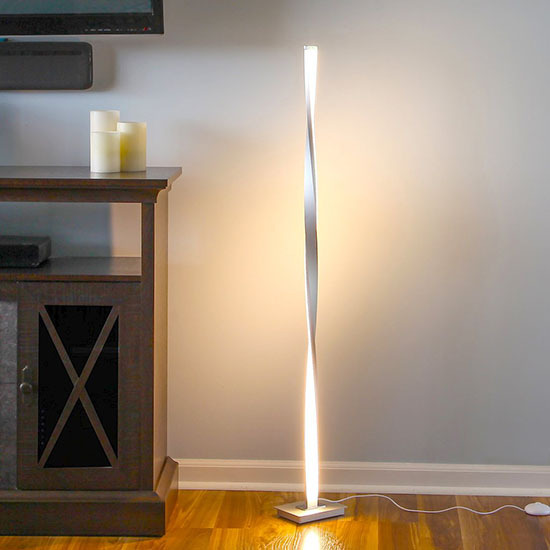 Like most Brightech lamps, this floor lamp also works with smart outlets which makes it compatible with Alexa, Google Home Assistant, or Apple HomeKit. It uses LED lighting. In terms of construction, the lamp has a wobble-free weighted base which makes it very stable. The lamp is made of strong durable metal which makes it safe and long lasting. Rivet makes a lot of beautifully designed home lighting and furniture and this one is no exception. This minimalist floor lamp has nice tripod legs. The drum shade has a handsome off-white textured fabric gives off a warm and cozy vibe to the room when turned on. The antique brass finish adds a nice elegant and classic look. The tripod base is made of sturdy metal which makes it strong and stable. The lamp utilizes a on/off pull chain switch on the socket. According to many users, the lamp is very easy to assemble. The Twist Floor Lamp by Brightech has such a creative and interesting minimalist design. It has a spiral-like shape with LED lighting flowing with the body. 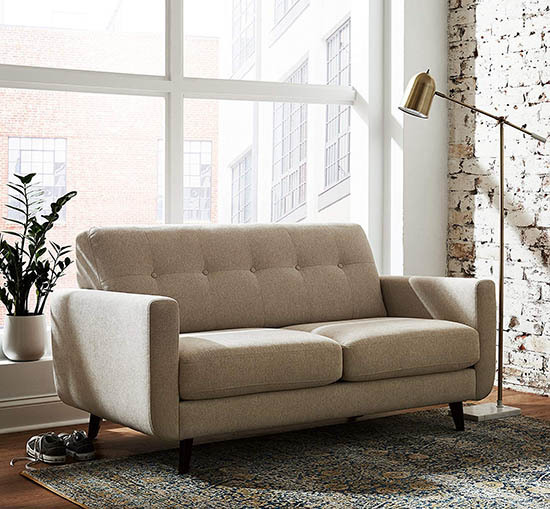 It is great if you want to add an alluring and creative character to your minimalist space. It has a futuristic yet sophisticated look. While it looks complex, the whole lamp is still compact in size. You can easily fit it in most narrow corners or small spaces. The LED Twist Lamp is environmental friendly. It is made using non-toxic material and also saves a lot of energy compared to traditional light bulbs. The lamp’s power button acts also as a dimmer and is placed on the foot switch pedal which is built into the power chord. Using the dimmer, you can set up different moods depending on occasions. This gorgeous pair of minimalist floor lamps has a very clean and modern design. It has an elegant square base, a thin cylindrical metal body and a small minimal lampshade at the top. I can imagine this pair of lamps would look good in a living room, placed to the left and right of a television, or to highlight an art piece. The lampshade is made of linen fabric with a nice off-white subtle texture. It has a black body and base, but the lamps also come in a silver body version. Furthermore, the small and compact size of the lamp makes it easy to fit any spaces. The Modern Floor Lamp by Wellmet has a very interesting design. The lamp’s body is a small table with tripod legs. 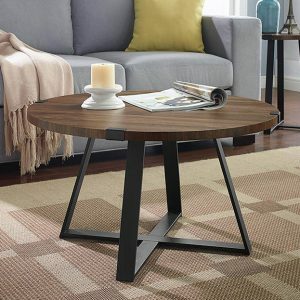 The table has a minimalistic round shape, and below it there is a “T” frame which can also act as a small shelf to put books or other items. The drum lampshade gives off a nice, warm and cozy ambiance. 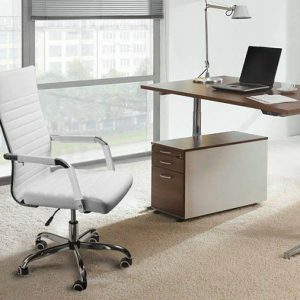 The desktop is made of high quality and durable wood, while the body is made of sturdy forged iron. 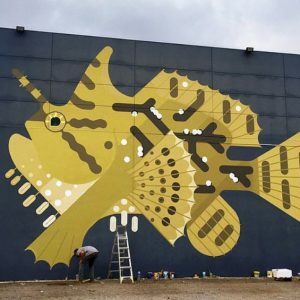 While it has a unique, almost quirky design, the overall design still looks minimalist and elegant. 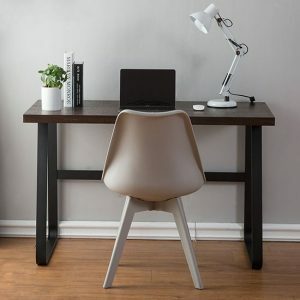 Interestingly, the desktop has two USB-ports which can be very convenient to charge smart devices, connect speakers or humidifiers. This is another creatively designed yet minimalist floor lamp. The lamp top is a beautifully designed two-ring circular lights, which a slim cylindrical body and a round base. I love how unique and futuristic it looks. 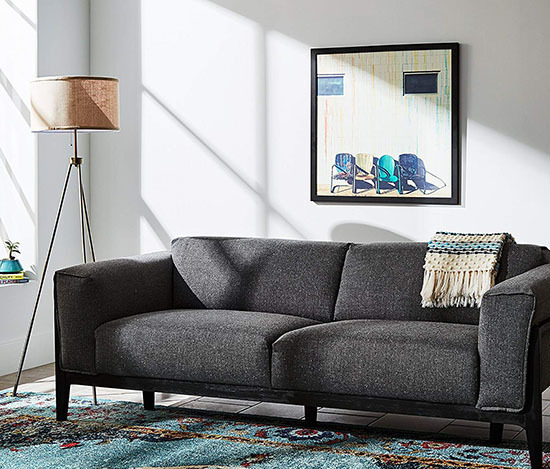 It can easily be a standout piece in your minimalist space. The lamp rings are adjustable and dimmable. You can choose among three different lighting settings from bright to soft, which is great to match with the mood you’re planning to set. In terms of construction, the lamp is made of durable metal. The lamp rings uses LED lighting which can last a very long time and save a lot of energy. 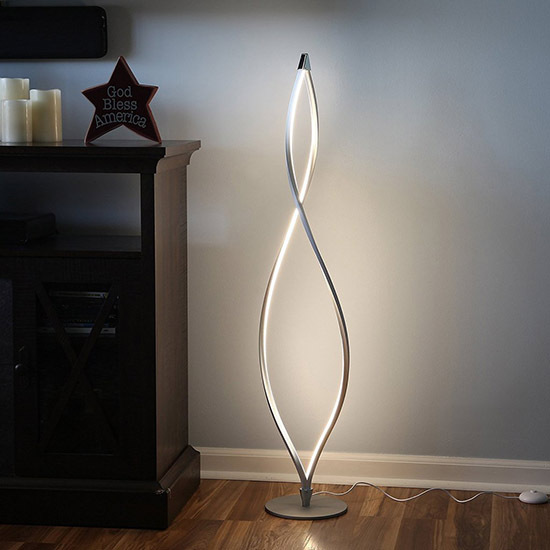 The Helix floor lamp has a alluring DNA-like spiral design. It looks really artsy and elegant. Great if you’re aiming for a nice creative and upscale look for the space. The lamp is dimmable which you can easily change the setting to fit a cozy bedroom or a bright office space. It utilizes a foot pedal switch which is very convenient. The main material is plastic which makes it light to move around. However the rectangular base is weighted which helps prevent the lamp from easily being knocked over. Just like most lamps with an interesting shape, it uses LED lighting which is long lasting and power saving. The Minimalist Modern Floor Lamp by Rivet has a wide circular base, a cylindrical curved body and an elegant modern lampshade that hangs downwards. It has a beautiful, sleek brass finish. The downward facing light makes it great for lighting tables. Putting it together is easy according to users. In terms of built, it is made of durable metal with a brass finish which gives it an upscale polished look. Also according to users, the brass finish is more matte than it is shiny. 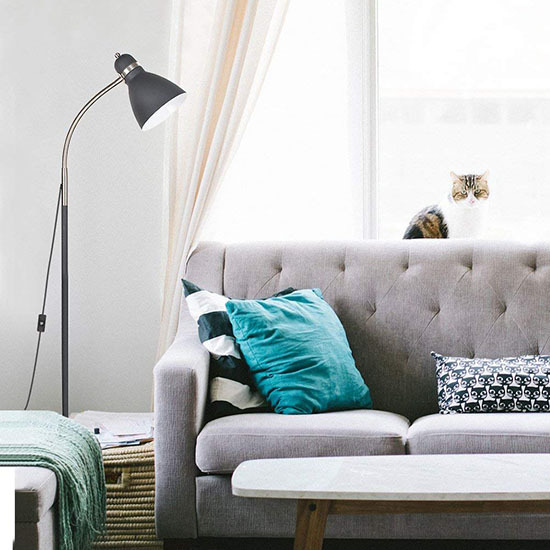 Another beautifully designed minimalist floor lamp by Amazon’s Rivet brand, this floor lamp has a round base, cylindrical body that curves 90 degrees at the neck and an almost round modern-style, almost futuristic lamp shade. The lamp has a gorgeous brushed nickel finish which makes it look more expensive than it is. The gooseneck is adjustable to fit your preferences. The overall lamp has a durable construction. It is made of strong metal, and the base has a good weight to keep it stable. It is also easy to assemble according to users. This last floor lamp on this list has a beautiful minimalist industrial design. It has a rectangular base, cylindrical 2-part body with an adjustable neck, and a bell-shaped metallic lamp shade. The base is made of marble which has a good weight and gives stability to the lamp. 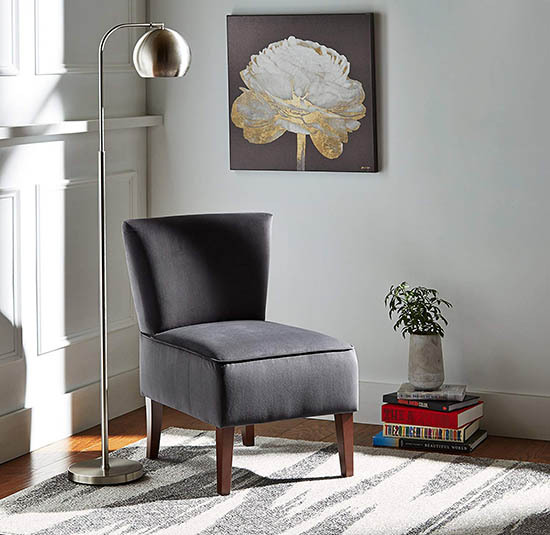 The body and lampshade has a sleek brushed antique brass finish that gives a luxury feel. The mouth of the lampshade has an acrylic lense which diffuses the light to give off a soft and relaxing illumination to the space. The lamp has a rotary dimmer switch which enables you to dial in your preferred brightness to fit the right mood you’re looking for. This floor lamp also comes in a charming table lamp version. 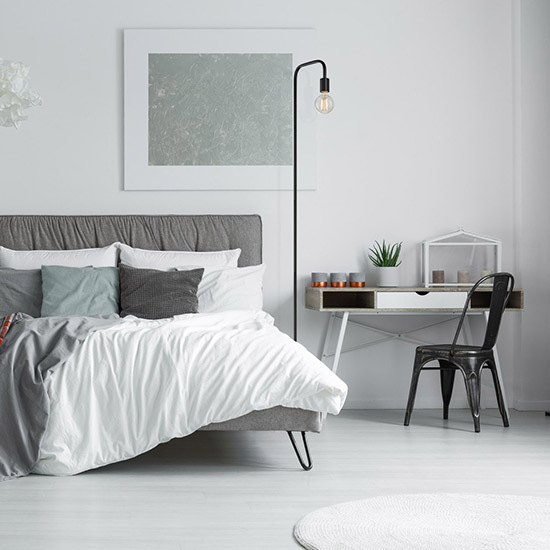 Finding the right minimalist floor lamps for your home out of thousands on the internet can be a huge challenge. Hopefully this list has helped make that a bit easier for you. If you’ve enjoyed this list, do subscribe to our email list for more minimalist design lists like this in the future!